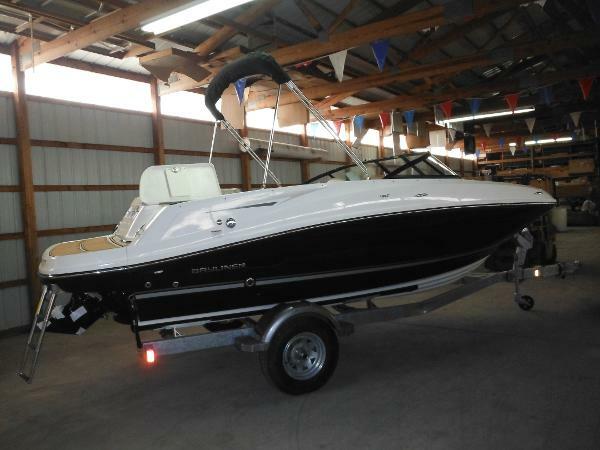 2017 Bayliner VR5 Bowrider 2016 Bayliner VR5 Bowrider with Mercruiser 190 HP inboard/outboard and galvanized trailer. 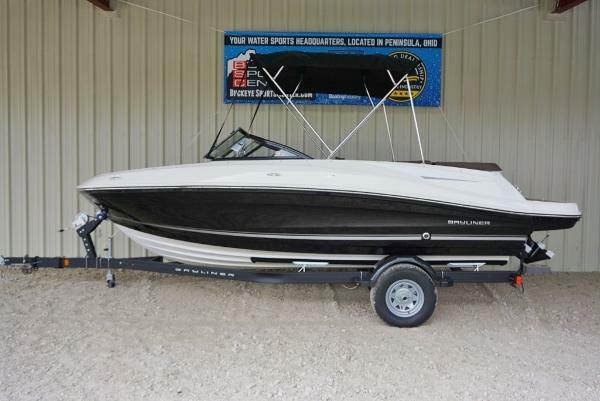 This brand new model features new innovative layout, seating, and excellent hull performance. Equipped with the optional stainless steel package, bimini top w/ boot, bow and cockpit custom snap-on covers, upgraded desert sand interior, bolster helm seat, bow filler cushion, Teak cockpit flooring, full windshield with side wings, and upgraded automatic bilge pump. 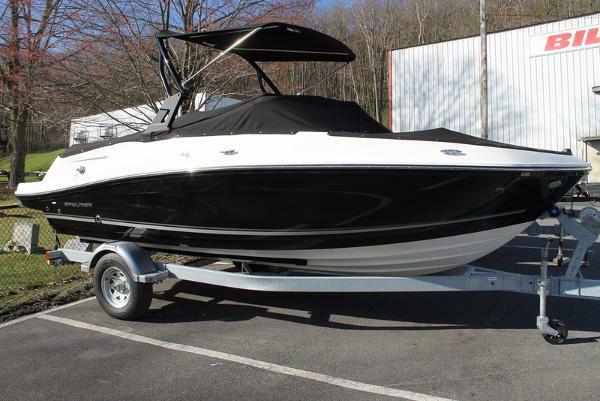 The VR5 builds on Bayliners proven V-bottom runabout heritage, while adding form AND function. Forward, the boat employs Bayliners category-leading BeamForward design, which carries the full 8 feet of beam further forward in the boat than has been traditionally done. The self-bailing cockpit features Bayliners new AftAdvantage design that increases the aft seating area by extending it to the aft most point of the running surface, then adding the swim platform at the end of the running surface. This keeps the platform apart from the usable interior space, rather than encroaching on it. The result is a boat that maximizes space and value like never before. Key Features: BeamForward design with high gunnels creates more passenger space, under-seat storage and safety. Exceptionally roomy cockpit thanks to our exclusive AftAdvantage design Standard integrated swim platform and optional platform extension are positioned further aft than comparable models adding interior space while providing the ideal staging area for water sports. 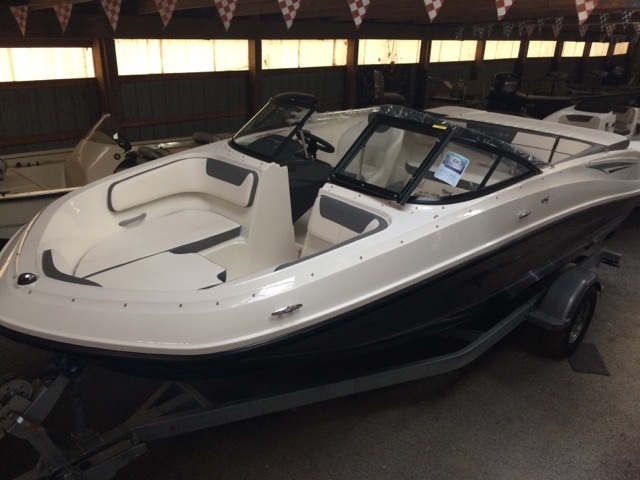 2017 Bayliner VR5 Bowrider Hull Color : Black/White - Features : Mercruiser 4.3 L 220 HP - Options included : Bimini Top, Cover, Teak Floor & Transom, SS Package, Bow Speakers, Auto Bilge, Interior Lighting, Desert Sand Interior. 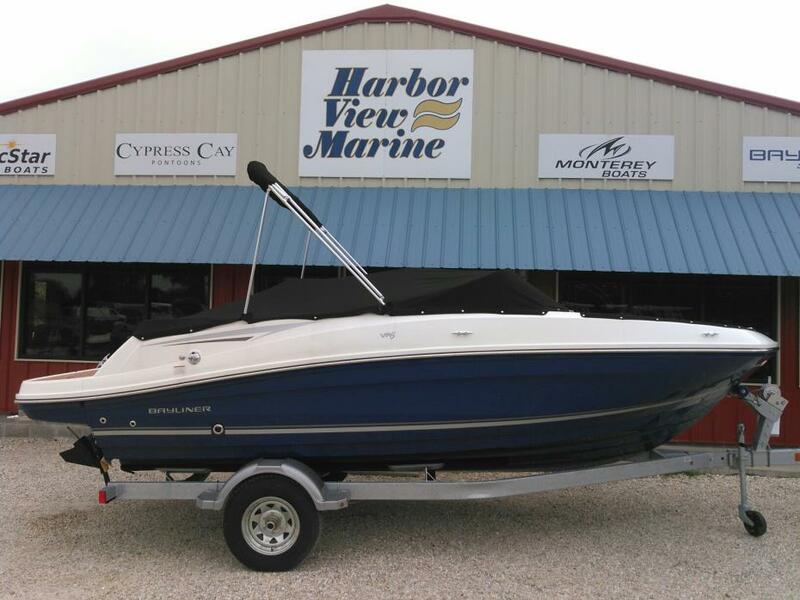 The VR5 builds on Bayliners proven V-bottom runabout heritage, while adding form AND function. Forward, the boat employs Bayliners category-leading BeamForward design, which carries the full 8 feet of beam further forward in the boat than has been traditionally done. The self-bailing cockpit features Bayliners new AftAdvantage design that increases the aft seating area by extending it to the aft most point of the running surface, then adding the swim platform at the end of the running surface. This keeps the platform apart from the usable interior space, rather than encroaching on it. The result is a boat that maximizes space and value like never before. Key Features: BeamForward design with high gunnels creates more passenger space, under-seat storage and safety. Exceptionally roomy cockpit thanks to our exclusive AftAdvantage design Standard integrated swim platform and optional platform extension are positioned further aft than comparable models adding interior space while providing the ideal staging area for water sports. 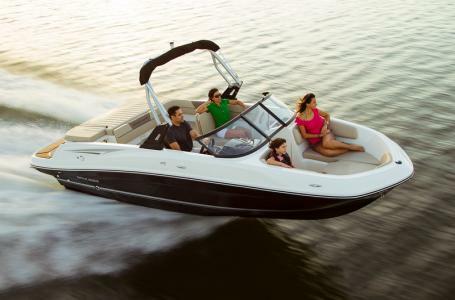 Available Water Sports or Fishing Options let you customize the VR6 to suit your family's needs. 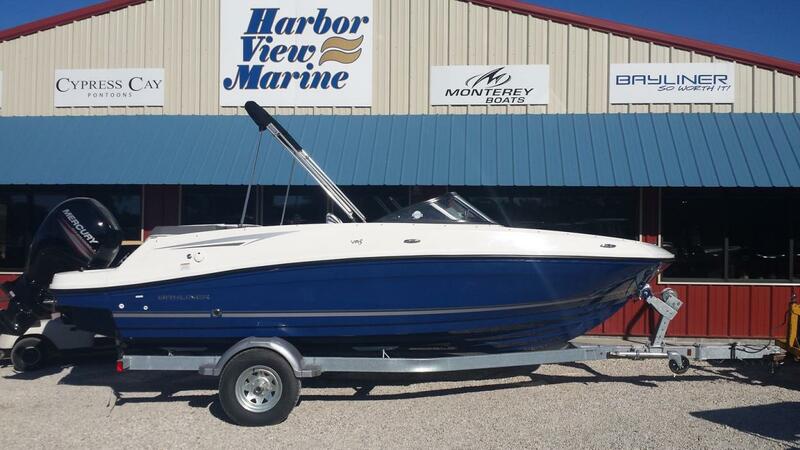 2017 Bayliner VR5 Bowrider OB The VR5 builds on Bayliners proven V-bottom runabout heritage, while adding form AND function. Forward, the boat employs Bayliners category-leading BeamForward design, which carries the full 8 feet of beam further forward in the boat than has been traditionally done. The self-bailing cockpit features Bayliners new AftAdvantage design that increases the aft seating area by extending it to the aft most point of the running surface, then adding the swim platform at the end of the running surface. 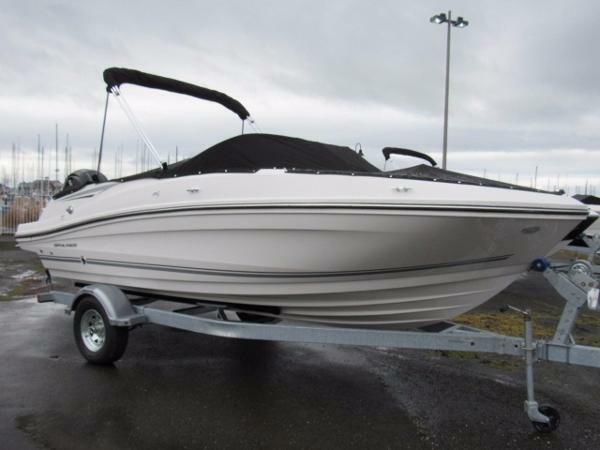 This keeps the platform apart from the usable interior space, rather than encroaching on itregardless of whether you choose outboard or sterndrive power. The result is a boat that maximizes space and value like never before. Key Features: BeamForward design with high gunnels creates more passenger space, under-seat storage and safety. Exceptionally roomy cockpit thanks to our exclusive AftAdvantage design Standard integrated swim platform and optional platform extension are positioned further aft than comparable models adding interior space while providing the ideal staging area for water sports. 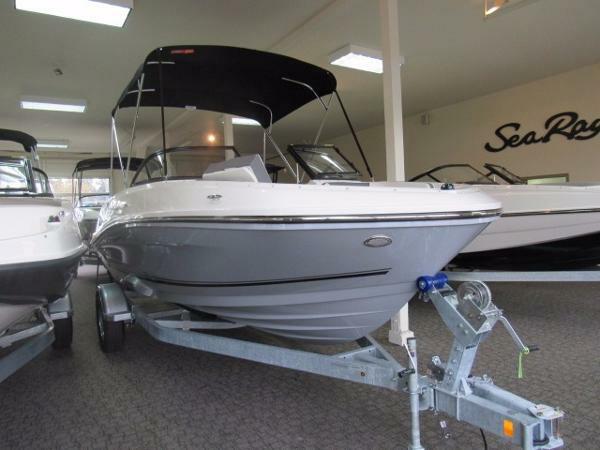 Available Water Sports or Fishing Options let you customize the VR5 to suit your family's needs. 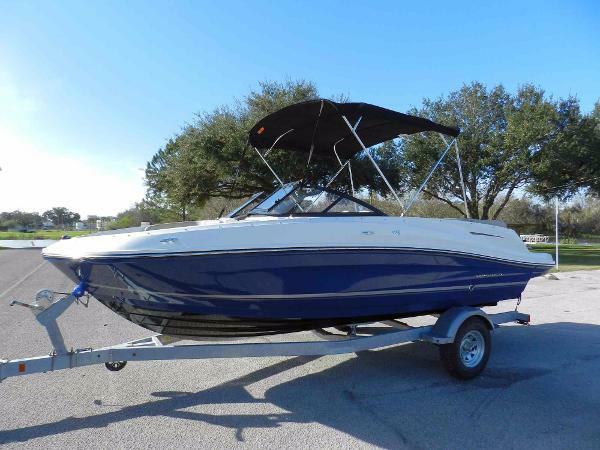 2017 Bayliner VR5 Bowrider Includes Trailer w/Swing Tongue and Brakes, Windshield w/Side Wings, Optional Bow Speakers, Helm Buckets Seats, In-Floor Ski/Wakeboard Storage, Stereo w/MP3 Input, Battery Switch, Bilge Pump, 12V Acc. 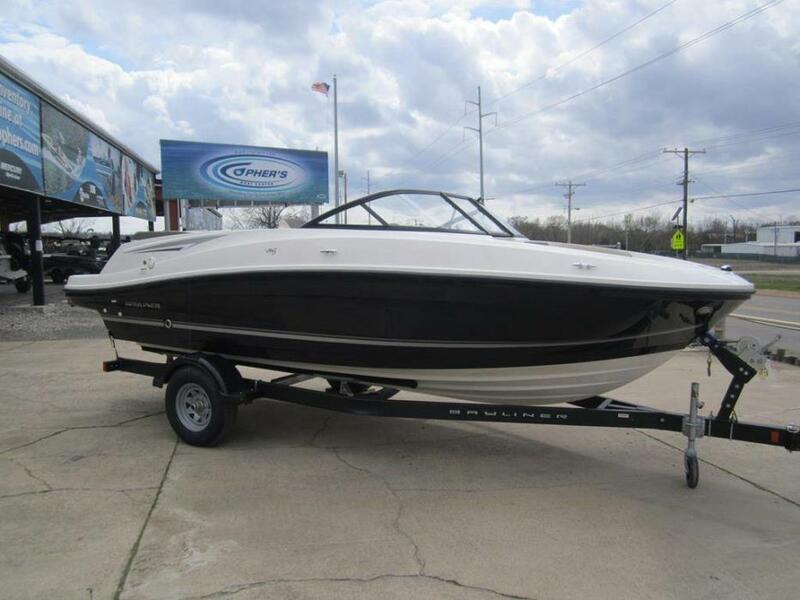 Outlet, Instrumentation, Tilt Steering, Navigation Lights, Transom Platform w/Ladder, Mooring Cleats . . . . The VR5 builds on Bayliners proven V-bottom runabout heritage, while adding form AND function. Forward, the boat employs Bayliners category-leading BeamForward design, which carries the full 8 feet of beam further forward in the boat than has been traditionally done. The self-bailing cockpit features Bayliners new AftAdvantage design that increases the aft seating area by extending it to the aft most point of the running surface, then adding the swim platform at the end of the running surface. 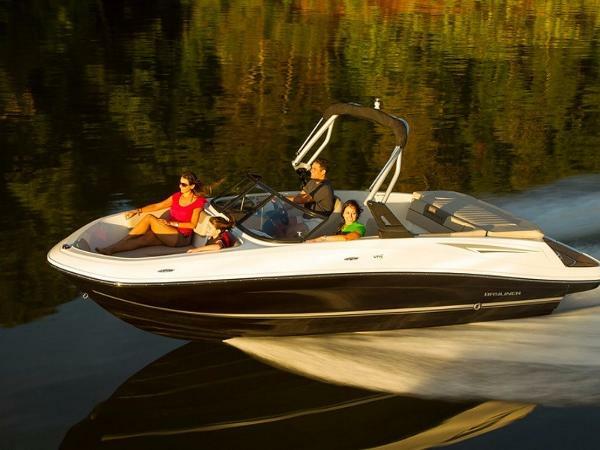 This keeps the platform apart from the usable interior space, rather than encroaching on itregardless of whether you choose outboard or sterndrive power. The result is a boat that maximizes space and value like never before. Key Features: BeamForward design with high gunnels creates more passenger space, under-seat storage and safety. Exceptionally roomy cockpit thanks to our exclusive AftAdvantage design Standard integrated swim platform is positioned further aft than comparable models adding interior space while providing the ideal staging area for water sports. 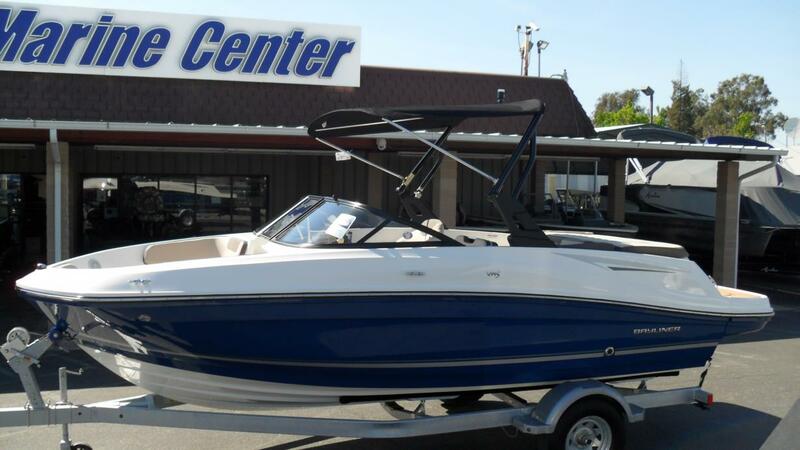 2017 Bayliner VR5 Bowrider Base Price $28,399, With Manufacture Upgrades $31,368! 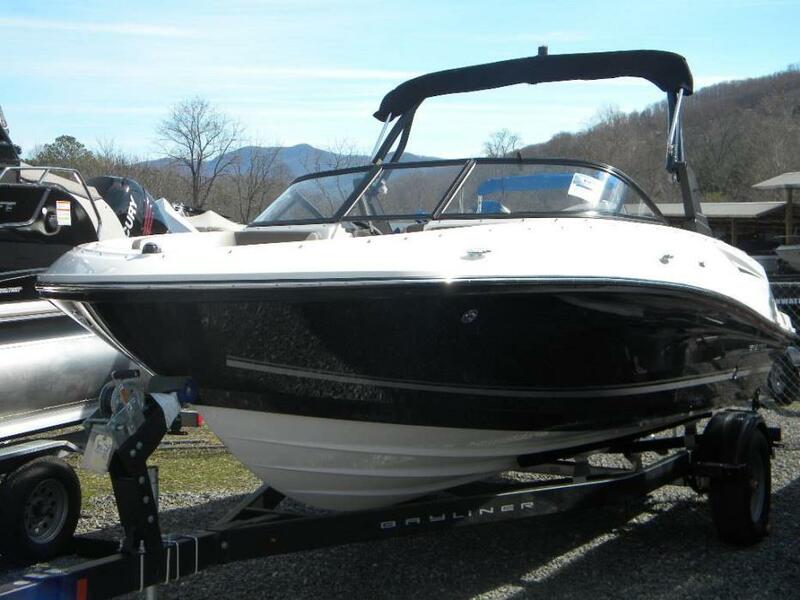 The VR5 builds on Bayliners proven V-bottom runabout heritage, while adding form AND function. Forward, the boat employs Bayliners category-leading BeamForward design, which carries the full 8 feet of beam further forward in the boat than has been traditionally done. The self-bailing cockpit features Bayliners new AftAdvantage design that increases the aft seating area by extending it to the aft most point of the running surface, then adding the swim platform at the end of the running surface. This keeps the platform apart from the usable interior space, rather than encroaching on it. The result is a boat that maximizes space and value like never before. Key Features: BeamForward design with high gunnels creates more passenger space, under-seat storage and safety. Exceptionally roomy cockpit thanks to our exclusive AftAdvantage design Standard integrated swim platform and optional platform extension are positioned further aft than comparable models adding interior space while providing the ideal staging area for water sports. Upgrades include: Bow Well & Cockpit Cover Automatic Bilge Pump Bimini Top w/ Boot Desert Sand Interior Digital Depth Finder Galvanized Trailer Helm Bucket Seat w/ Back Bolster and Back Port Stainless Steel Upgrade (stainless steel accents) Swim Platform w/ Teak Mat Windshield w/ Walk Through and Side Wings Tax, freight, prep, dealer options and documentation fee not included in sale price. Dealer not responsible for errors.